I recently started being mentored by one of the godliest women I know, & I am so thankful for the opportunity to seek wisdom and learn from her. I feel such a big calling on my heart to raise champions for the Lord, and I also know that the BEST way to be a great mom is by being a great wife first. I truly believe the enemy attacks the family unit because it is so precious to God, so the best way to safeguard your family is through having a strong marriage with a foundation in Christ. I know I definitely have some work to do in that area to ensure that I am truly honoring the Lord in my role as Jonathan’s help meet. And that’s exactly why I prayed for a mentor. God was faithful. My mentor and I are reading through Created to Be His Help Meet & working through the workbook called The Help Meets Journey . (I already had the book because Lori recommended it.) **FYI: They are incredibly challenging (for me, anyway) & if you decide to go through them, I encourage you to take your time and really DIG in. And also to be open minded because it definitely goes against the world’s view of a wife’s role & of marriage in general. Ask the Lord to prepare you heart and show you areas where you can grow to become a more godly help meet. At the beginning of the workbook it asks for some specific goals you’d like to see come to fruition in your marriage as a result of the study. One thing I wrote down was for Jonathan to feel more honored/reverenced and for me to feel more cherished. If you have read Love & Respect then you know one of a husband’s greatest needs is to feel respected and one of a wife’s most innate needs is to feel loved. I believe that is true and something we strive towards in our marriage. It was even part of our vows. But to me, reverencing & cherishing take those a step further. They dig even deeper into marriage, beyond just love & respect, and THAT is my desire. I want our children to see that not only do we love & respect one another, but we CHERISH & REVERENCE one another. That we are “heirs together in the grace of life” (1 Peter 3:7). Going through this study, the Lord has really impressed that word upon my heart. REVERANCE. I looked up the Hebrew word and origin & studied some commentary on Ephesians 5:33 (and a few other Scriptures I listed below). Reading those & truly understanding what it means to be a help meet has completely changed my mindset about my roles as a wife. It is no secret if you’ve read my blog for some time then you know I think Jonathan Butler is THE MAN. He has some really, really great qualities that I respect & admire and pray our children learn. I think our world desperately needs more Jon Butlers in it (which is part of why we want a big family). But if I can be totally honest & transparent, I have lived the majority of our marriage as if HE was created to be a help meet to me instead of the other way around. 1 Corinthians 11:9 says “Neither was man created for woman, but woman for man.” (Shew- I know some ladies – even Christian ladies- who might not like reading that one.) I might have respected Jonathan for the past 4 years of marriage, but I cannot confidently say I have “reverenced” him as Ephesians 5:33 says to do. I know what the Bible says about marriage and my role as a wife. I understand Biblical submission and totally agree with it. Jonathan is the head (1 Corinthians 11:3), & my job is to support him in that role. I have written blog posts about it & taught Bible studies on it, but just being totally real with y’all, sometimes a lot of times I have a tough time actually living it. I’m not confessing that here for accountability. There is no way anyone other than me, him, and the Lord know whether or not I am being the help meet I am called to be. I just want to share this because I know there are other wives like me….who desire to be that virtuous woman…to be obedient to the Lord (even when it’s tough, which submission can definitely be)…to be a help meet to her husband…to be a godly mother. And maybe you’re like me and feel like you’re “trying your best.” But that’s just it. Although God certainly wants our best, more than anything he wants our HEARTS. When we give Him that, we can REST & allow the Lord to work through us. (So now I’m working on accepting that despite this revelation, it is still a process.) When HE has our hearts, we can have a marriage that glorifies HIM and allows us to feel loved and cherished while our husbands feel respected and reverenced. The biggest wake up call came for me while I was praying for Jase’s future wife. I do that often. I was praying for her specific qualities and character traits as described about a Biblical wife, and as much as it makes me want to puke & cry all at the same time, I have to confess that I do not want him to marry someone like me. Not like the wife I am right now anyway. I have always said I want to be the kind of wife to Jon that I want my daughters to be and my sons to marry, but the truth is, I am not being that wife. When I realized that, I knew I needed to do some serious repenting & growing. It’s not because Jonathan does or doesn’t deserve it. Or because I want a pat on the back. Or because he is loving me like Christ loves the church. (Yikes…may have thrown that one around a few times.) If you read both before and after those verses in the Bible, you’ll notice it doesn’t say “reverence your husband IF”… “submit to your husbands IF”…It just says DO. And that goes so against what the world teaches & what our flesh (my flesh anyway) want to do. Ladies, that is EXACTLY why I have to allow the Lord to do it through me. Because as strong as I would like to think I am, I cannot do that on my own. I just can’t. A huge problem for me is my big, fat mouth. That bad boy gets me in trouble, so I feel like this verse was written for me. I am praying the Lord helps me have a more gentle and quiet spirit. Anyway, I wanted to share all of this with you in hopes it helps you have a more clear understanding of our Biblical role as wives and help meets to our husbands. I need the reminder often. I know God has BIG plans for our family and for Jonathan especially, so he needs me to be a godly wife who reverences him. My desire is that God be glorified through our marriage and we raise up champions for the Lord who will be godly spouses some day. I’m going to leave off with these this excerpt from the book that hit me right in the heart. 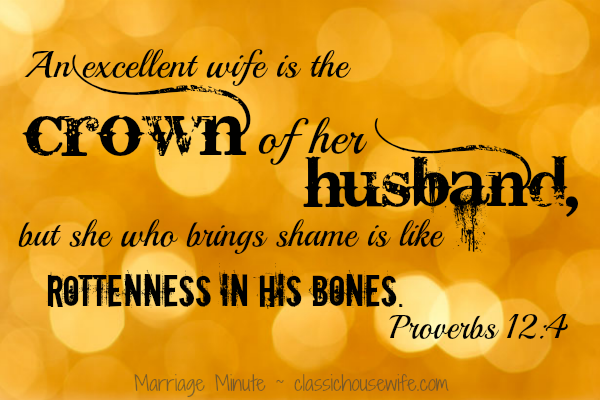 Wives, are you reverencing your husband?? If you get a chance, look up The Message version of these verses too. 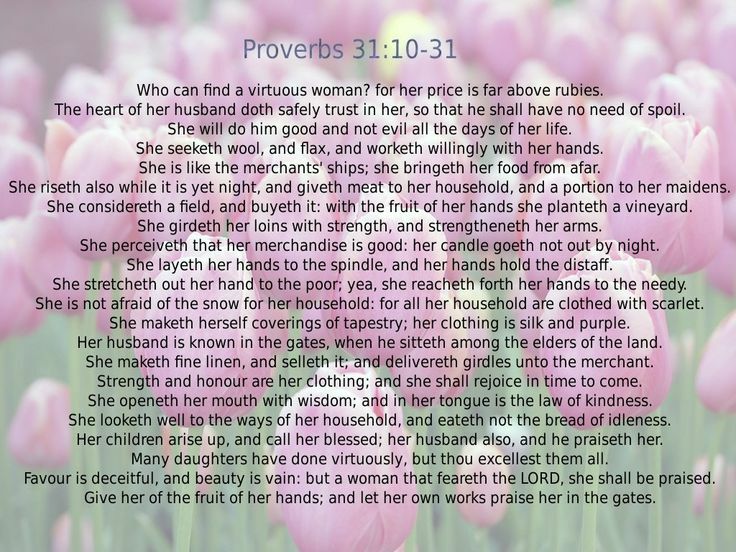 Proverbs 31:10 Who can find a virtuous woman? for her price [is] far above rubies. Proverbs 21:19 It is better to dwell in the wilderness than with a contentious and an angry woman. 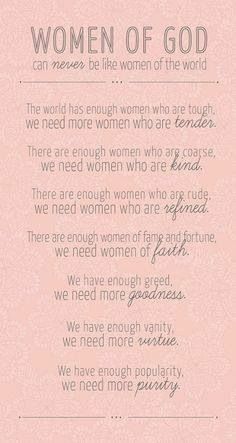 Proverbs 14:1 - The wisest of women builds her house, but folly with her own hands tears it down. Proverbs 19:14 House and wealth are inherited from fathers, but a prudent wife is from the Lord. Wow! I can soooo relate to this. I have problem with my mouth too. I like the statement you made that a man's ability to lead greatly depends on his wife's ability follow. That struck a cord. Well this is a big ol slap of a wake up call after a small tiff this morning with my husband. Thank you for posting it, today, because I needed to hear it. I admit I get into the IF a lot, if he's nice to me, I'll go out of my way, but that's wrong. Your post is so well written, thank you! Danielle I love reading your posts so much! And I really benefit from them. I really didn't grow up in a "Christian home" -- my parents had their views on God and I had my own. I want you to know that I truly appreciate your posts and love your opinion/insight - you have instilled something in me that I can't explain! Thank you! This was such a wonderful post! I took my bible out immediately and highlighted all the verses you mentioned. Such powerful, meaningful scriptures to always try and abide by! Thank you so much for all your encouragement for all us wives and mommas!! I realllllly needed this post. Thank you for sharing. Thank you for this post, it is SUCH an important topic. Your passionate desire and longing to be a godly wife is not only refreshing, but incredibly encouraging. I love reading your blog and agree with everything you stand for, thanks again for your inspiring words.